Here we present an example for visualizing slices from 3D images. Let’s download and load a T1. Create a Scene object which holds all the actors which we want to visualize. 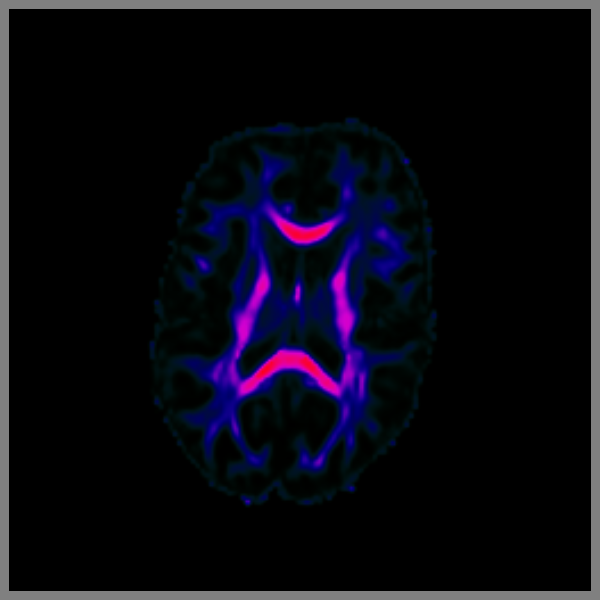 The T1 has usually a higher range of values than what can be visualized in an image. We can set the range that we would like to see. The slice function will read data and resample the data using an affine transformation matrix. The default behavior of this function is to show the middle slice of the last dimension of the resampled data. The slice_actor contains an axial slice. 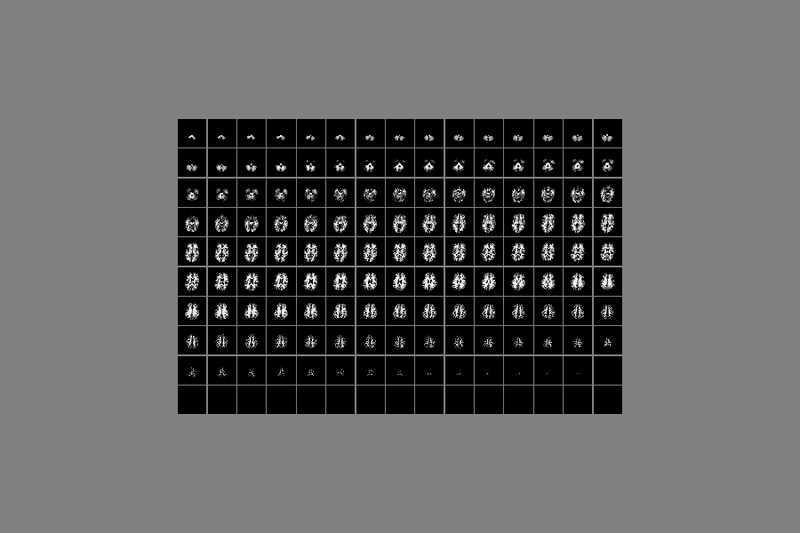 The same actor can show any different slice from the given data using its display function. However, if we want to show multiple slices we need to copy the actor first. 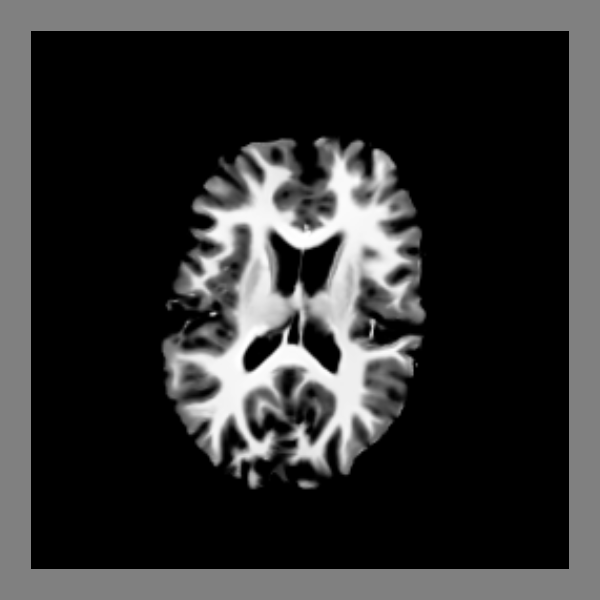 Now we have a new slice_actor which displays the middle slice of sagittal plane. In order to interact with the data you will need to uncomment the line below. Otherwise, you can save a screenshot using the following command. Notice here how the scale range is (0, 255) and not (0, 1) which is the usual range of FA values. This is because the lookup table is applied in the slice after interpolating to (0, 255). Now we would like to add the ability to click on a voxel and show its value on a panel in the window. The panel is a UI element which requires access to different areas of the visualization pipeline and therefore we don’t recommend using it with window.show. The more appropriate way is to use the ShowManager object, which allows accessing the pipeline in different areas. Add a left-click callback to the slicer. Also disable interpolation so you can see what you are picking. """Get the value of the clicked voxel and show it in the panel.""" By using the copy and display method of the slice_actor becomes easy and efficient to create a mosaic of all the slices. So, let’s clear the scene and change the projection from perspective to parallel. We’ll also need a new show manager and an associated callback. Now we need to create two nested for loops which will set the positions of the grid of the mosaic and add the new actors to the scene. We are going to use 15 columns and 10 rows but you can adjust those with your datasets. If you uncomment the two lines above, you will be able to move the mosaic up/down and left/right using the middle mouse button drag, zoom in/out using the scroll wheel, and pick voxels with left click.